The 6:00 a.m. explosion blasts a nine-meter-thick layer off a block of migmatite in a 750-square-meter area where century-old trees had thrived in this patch of Amazon rainforest near the cities of Altamira and Vitória do Xingu (state of Pará, Brazil). When the dust clears, all that’s left of this hard, granite-like rock is a huge mound of rubble. By midnight, not even a boulder will be among the remains. Two bulldozers sit side by side, 50 meters apart. After each one lifts five loads in less than three minutes, they have filled an off-road truck with 32 metric tons of rock. As one leaves, another arrives. Within 20 minutes, 18 of these rock-filled dump trucks have left, with not a second to spare. The frenetic pace of men and machines marks the excavation of a 20-kilometer-long canal through which 14 million liters of water per second will be diverted from the Xingu River, with a flow rate almost 140 times greater than the canal that diverts water from the São Francisco River, another major waterway. Water from the Xingu River will power the turbines of the third largest dam in the world, and also among the most controversial: Belo Monte, being built by the Norte Energia S.A. consortium. When fully operational, the dam will generate up to 11,233 megawatts (MW) of electricity. Its installed capacity is sufficient to illuminate the homes of at least 18 million people. In terms of generating capacity, only China’s Three Gorges dam (22,720 MW) and the binational (Brazil/Paraguay) Itaipu dam (14,000 MW) are bigger. According to the Energy Research Company (EPE), the research arm of the Mines and Energy Ministry, Brazil needs to annually add 6,350 MW of electricity by 2022 to its current generating capacity of 121,000 MW (70% of which is produced by hydroelectric plants). If Belo Monte could generate at full capacity all year round, it would provide one-fifth of that additional power that the country will need by then. But it will generate at full capacity only four months per year. Most of the generating capacity (11,000 MW) of the dam will be installed in its main powerhouse, near the village of Belo Monte do Pontal, whose construction is 47% complete. The main dam, technically speaking, will be 60 kilometers upriver, in the middle of the Big Bend of the Xingu River, at the Pimental construction site. That dam will divert water into the canal that will fill a 130-square-kilometer reservoir between it and the main downriver powerhouse. Six turbines of an auxiliary powerhouse along the spillway of the Pimental dam will generate up to 233 MW of additional power. Its peak capacity of 11,233 MW can only be reached between February and May, when the Xingu reaches its maximum flow rate. During the other months, the turbines will be gradually turned off. Between these high and low generating periods, Belo Monte is expected to guarantee an average 4,571 MW of power, or only 41% of its installed capacity. “Before energy generation can begin, all this [excavation] must be completed”, said 35-year-old, civil engineer Roberta Martinelli Pimentel Pereira, pointing to the canal, wide enough to easily fit 60 trucks, parked side by side. 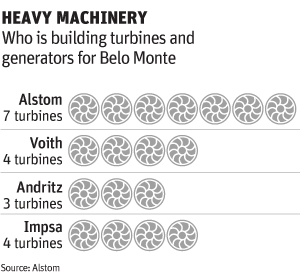 Belo Monte needs to start producing energy in February 2015, when the first turbine in the auxiliary powerhouse begins to operate, but this objective faces a three-month delay. Afterwards, from March of 2016 to January of 2019, the main powerhouse’s 18 turbines will gradually be started up –delays can’t occur in this case. In fact, Norte Energia is operating under the assumption that, from the fourth or fifth turbine on, it can install the turbines ahead of schedule, enabling all of them to be functioning before the contractual deadline. This means considerable gains for the consortium. Currently, Roberta Pereira’s greatest challenge is to reign under control the water from the igarapés (streams) that cross the path of the gigantic canal to, this very December, complete a temporary dike of rocks and dirt to divert water away from the Xingu River and keep the canal construction site isolated from it. This slim engineer is in charge of 7,000 employees and has logged 12 years “in the trenches”, a reference to the major infrastructure projects in which she has been involved. Foundations for the dike have been completed, and most of it has reached the safety level of 95 m.
Work at Belo Monte occurs at a feverish pace 24-hours-per-day, two-and-one-half years after its construction officially began in June 2011. The dam, with an estimated cost of R$ 30 billion (about $ 13 billion), faces a fast-approaching, 44-month deadline for power generation to begin. Itaipu faced a 120-month deadline, the Santo Antônio dam, on the Madeira River faced an estimated 52-month deadline, but it began to generate electricity nine months ahead of schedule. Belo Monte reached a manpower peak in October, when 25,000 laborers (87% of them men) were working on it. Around 75% of Brazil’s over 5,600 municipalities have a population smaller than this army of workers. From towns much smaller than the construction site of the dam came João, José, Antônio, Pedro and Joaquim (who ask that their real names not be mentioned). Sitting together on a Sunday afternoon on the sidewalk of João Rodrigues Avenue, in the city of Altamira, they drink a mix of vodka and a lemon-flavored soft drink. They arrived a little over one month ago and are already thinking of leaving. For them, Belo Monte has been one big disappointment. “Our salary, compared to what other states pay, is down here”, says João, with his index finger near the ground. João is no novice dam-builder. In 2011, he worked on the Santo Antônio dam on the Madeira River. He says that there, his income ranged between R$ 1,700 and R$ 1,800 per month ($740-780). At Belo Monte, his beginning salary was no more than R$ 1,200 per month ($520). 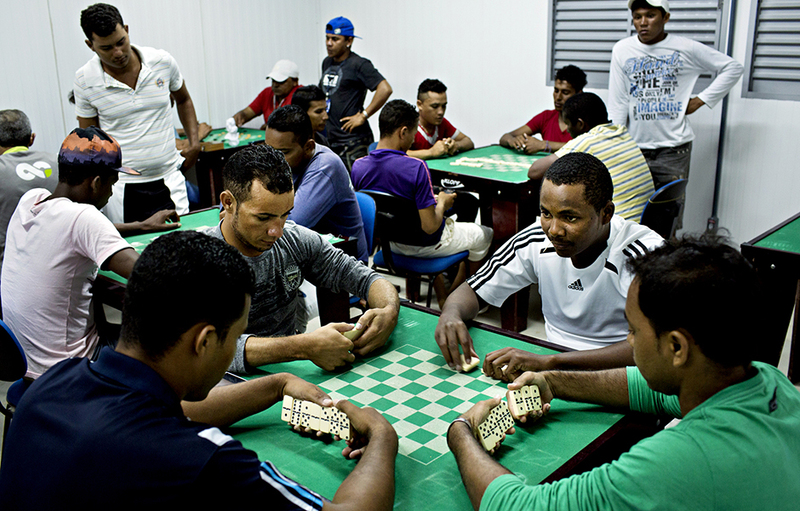 A maximum of 10 additional hours of work per week, negotiated between the Belo Monte Construction Consortium (CCBM) and Sintrapav (the Pará state union of heavy-construction workers), prevents employees housed at construction sites from working more than 54 hours per week and from thus increasing their paychecks. Over two-thirds of the workers come from outside Altamira, the city nearest the dam. Isolation from their families is aggravated by the construction site’s having telecom signal connections provided only by one operator, Oi, among whose main shareholders is Andrade Gutierrez, the head of CCBM contractors (which also include Odebrecht and Camargo Corrêa). Those with mobile phones from other telecom operators have a hard time talking with their wives and children. 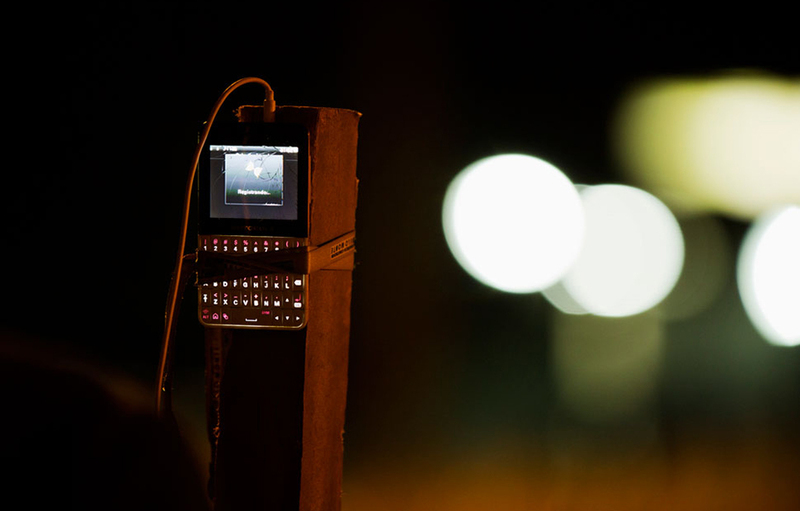 The most persistent discover that they can pick up traces of a signal on the hill where the water tower is located near the Canal site housing quarters, where they can be seen with their mobile phones tied to stakes driven into the ground. According to a Datafolha opinion poll, which interviewed 246 dam workers in Altamira, most of them are married (51%) and only 40% have spouses living in the city. 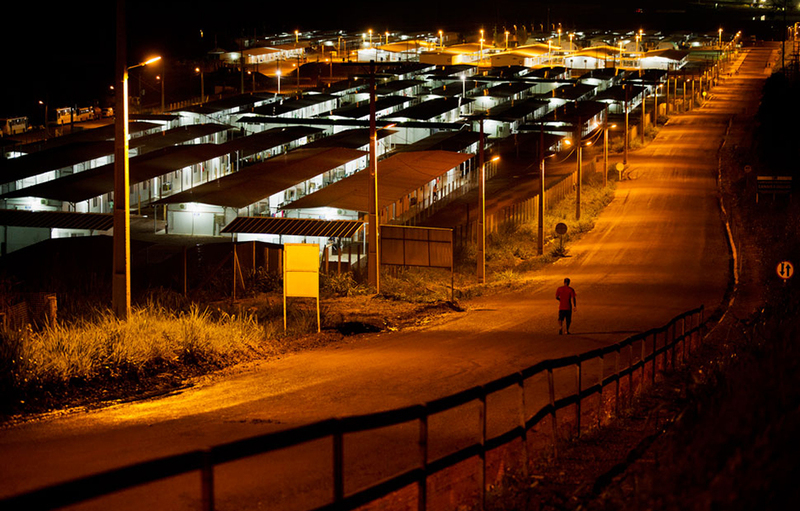 Two out of three Belo Monte workers have been there less than one year and at least half of them don’t plan to stay. 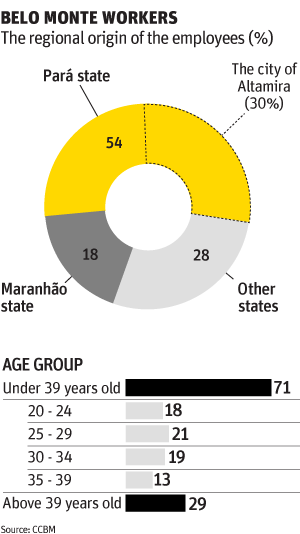 They only came in search of a job (38% of them have worked on other dams in Brazil). The housing quarters have dorms that sleep no more than four people, with air conditioning, internal bathrooms and hot water. Dozens of such rooms comprise the so-called “condominiums”, which can only be entered with the correct magnetic ID card. Around internal patios separating condominiums, wire fences isolate the dorms. The recreational options include watching TV or films, going to the gym, playing pool, dominoes or table soccer (in which players use soccer figures mounted on rotating bars to “kick” the ball into the opposing goal, by twirling the bars). There are areas for religious-cult worship and rooms with computers. A 200-seat cinema is about to be opened. According to Datafolha, 57% of the dam workers live in construction-site housing. Most of them approve of the housing’s comfort (89% rate it either excellent or good), cleanliness (an 84% rating), organization (71%), and recreational options (70%). Opinions are divided only about the quality of the meals: 45% say they are excellent or good, and 45% say they are average. Workers’ strikes, like the one that stopped all the construction work by the end of November, indigenous peoples’ protests, court-issued suspensions of construction, and environmental licensing problems, can delay Norte Energia’s timetable for starting power generation. As part of a contract signed with the government, the fine for noncompliance with the deadline for generating power is up to 2% of the dam’s annual revenues. Norte Energia also has to buy from other companies the energy that it can’t deliver, at a cost of up to R$ 1 million ($435,000) per day for each turbine not yet operating, depending on the market price of power at the time. Taxpayers would have to shoulder this financial loss because, even though Belo Monte was planned as a private-sector project, at the end of the day the dam is owned by the government. It’s not by chance that the federal National Security Force (specially-trained military policemen and firefighters) takes part in monitoring the undertaking. In 2010, when Norte Energia won the auction to build and operate Belo Monte, it was little more than an agglomeration of medium-sized civil construction and energy companies (Bertin, Queiroz Galvão, J. Malucelli, Cetenco, Galvão Engenharia, Mendes Júnior and Serveng), along with state-owned companies led by Chesf (the São Francisco River hydroelectric company). Since then, the group’s composition has evolved into an association of state-run companies and pension funds who hired contractors that placed losing bids at the dam’s concession auction. All of these firms are part of the CCBM consortium. Antônio Kelson Elias Filho, 55, is the project director of Norte Energia. With an accent typical of someone from Minas Gerais state, his direct manner, and his forceful voice, Kelson is the true commander-in-chief of this mega-project. He gives orders all the time, either personally, or via the telephone. In recalling his reaction after the consortium, the favorite to win the auction, did so, Kelson exemplifies the state of mind of the improvised army that took command of Belo Monte: “Piauí [a small and poor northeastern state] won the war with the USA. Now, it must occupy”. Everything at Belo Monte is colossal. 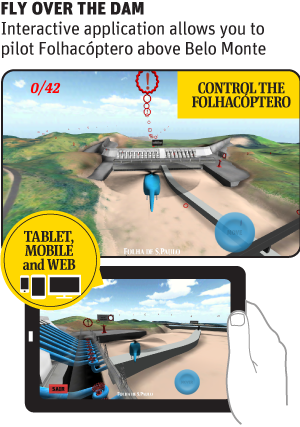 The 20-kilometer canal, under the command of engineer Roberta Pereira has a bed at least 200 meters wide and, at the upper edge of its sloping embankment, its width can surpass 300 meters. The water will reach a depth of 22 meters, the equivalent of a seven-story building. The dam at the Pimental site will span eight kilometers. 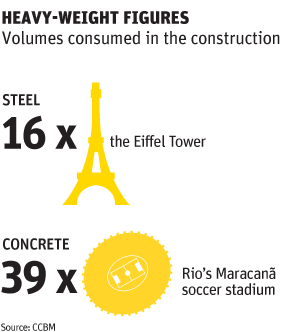 The powerhouse, the heart of the dam, at Belo Monte do Pontal, will feature18 turbines, each five meters high and 8.5 meters in diameter, set in recesses excavated from virgin rock, at a height equivalent to that of a 45-story building. The generators moved by the turbines are 22 meters in diameter and need to be taken to the region in parts, because it is impossible to transport them as one piece. Seven of the turbine/generator assemblies began to be assembled this month at an Alstom plant in Taubaté in São Paulo state, more than 2,300 km from Altamira. Completing construction of the turbine’s wheel assembly requires three types of soldered parts, the cube wheel (the smaller wheel), cast at a South Korean foundry, the belt wheel (the bigger wheel), made in China, and the turbine’s blades, built in Piracicaba by Brazil’s Dedini company. Unlike the generator, the turbine’s wheel assembly is transported as one piece –320 metric tons of stainless steel– to Pará state. Each trip should take three to four months, by truck to the city of Santos, then by ship to the Amazon city of Belém, and finally by barge to a port built in Belo Monte. The contract with Alstom, a French firm involved in corruption scandals that leads the consortium responsible for 14 of the 18 turbine/generator assemblies, is worth R$ 1.3 billion ($565 million). Alstom will deliver the first assembly to the Belo Monte-site powerhouse at the beginning of 2016. The other four assemblies are being built in the coastal town of Suape in Pernambuco state by Impsa, an Argentine multinational separately contracted by Norte Energia. Construction logistics have not been easy. The Transamazônica highway, opened in the 1970s, still has unpaved stretches in the 906 kilometers that separate Altamira from the Pará state capital of Belém, which makes them impassable during the rainy season, from December to June. The building of 270 kilometers of access roads from the Transamazônica to the construction site has accelerated the rate of construction. In 2011, when work began, a truck would take four or five hours to go from the Transamazônica to the Pimental site. Now it takes 40 minutes. In July 2011, protests closed the Transamazônica. To feed the workers, the consortium had to contract two cargo planes, at a cost of R$ 80,000 ($35,000), to bring them rice and other foodstuffs, bought in Belém. When the food was flown in, there was only enough for three days of meals. 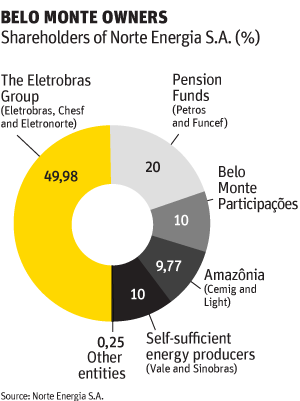 Transport expenditures account for around 8% of the total cost of Belo Monte. “If the Transamazônica were paved, we would have saved R$ 200 million [$87 million] of the R$ 800 million [$348 million] already spent on transport”, calculates Marcos Sordi, CCBM’s administrative director. The consortium’s estimates that, by the end of this year, about half of the Belo Monte construction will be completed. The work on the Xingu River dam that needs to be completed in 2014 to start up the turbines at the auxiliary powerhouse at the Pimental site in 2015 will be 47% finished. The engineers affirm that everything is on schedule. 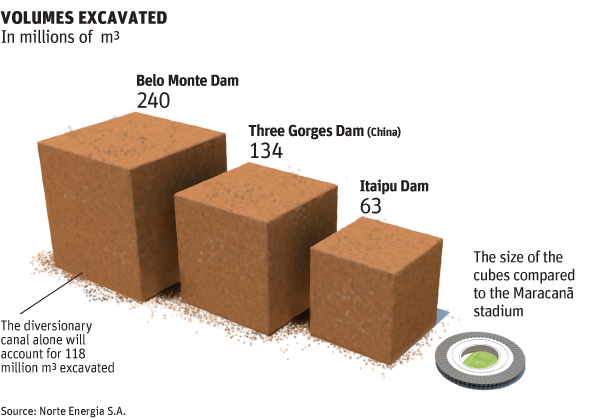 Migmatite is one of Belo Monte’s biggest secrets. The abundance and hardness of this rock allowed engineers, after 10 months of trials, to make a major change in the original project. Instead of coating the bed of the mega-canal with concrete, they decided to line it with crushed rock (pieces of up to 20 cm in diameter). This will avoid the use of 1 million cubic meters of concrete, save R$ 200 million ($87 million) and reduce the time spent building the canal from 27 to 16 months. The rocks, however, form a rougher surface than concrete, which, because of attrition, causes the diverted river water to flow towards the reservoir at a slower pace. And the velocity of the water is fundamental in the generation of energy to guarantee that an adequate volume feeds the turbines. A hydroelectric plant is based on the principle that a large volume of water flows from its highest to its lowest point as quickly as possible, thus spinning the turbines that turn the generator. The energy is produced by the circular movement of a rotor lined with coiled copper inside the stator, the stationary part of the rotary system, also lined with copper. It’s just the opposite of an electric motor which consumes electricity to produce movement, while the generator converts mechanical energy into electricity. To compensate for the loss in the velocity of the water in the crushed-rock-lined canal, it was necessary to “enlarge the pipe”, this is, to widen it by 35%. This means more trees to remove, more migmatite to explode and extract, more bulldozers and dump trucks to haul off debris. In Norte Energia’s accounting, there is no margin for error. Even after studying the project for 35 years, the Federal Accounts Tribunal (TCU), the equivalent of the U.S. Government Accountability Office, pointed out, before the dam’s concession auction in 2010, that the Belo Monte project entailed “an elevated level of uncertainly incompatible with the size of the undertaking”. Companies eyeing Belo Monte considered the government-estimated budget for the project to be insufficient to build the dam, pay its bills, and generate a 6% per year return on capital invested. Whoever bids for a dam concession know that its main source of future income is the sale of energy to the national grid. In the case of Belo Monte, the government estimated in 2008 that an energy tariff of R$ 83 ($36) per megawatt-hour (MWh), would be sufficient to cover all costs and provide a profit. Whoever offered the lowest tariff would win the bid. When a concession is disputed, a bidding company needs to offer a reduced price on this tariff –provided that its simulations indicate that it can earn more from the selling of energy, even if with a lower profit margin, or undertake the project at a lower-than-expected cost. On the other hand, if the project turns out to be more expensive than the cost budgeted by the winning bidder, or if the dam doesn’t generate enough energy by the expected deadline, the company takes a loss. “What the consumer cares about is the final price [he pays for energy]. Our estimates are irrelevant”, says Maurício Tolmasquim, the president of the state-run Energy Planning Company, responsible for setting the rules of the auction. In April 2010, Norte Energia won the bid for the concession to build Belo Monte, offering a tariff value 6% lower, R$ 78 per MWh ($35), than the reference price. The cost of the undertaking, estimated by Norte Energia, however, was 30% higher than the government’s estimate. Experts in the market don’t think it is possible for the consortium to recoup its investment, based on the tariff it offered. A decision by Eletrobras made months after the auction reinforces this suspicion. Eletrobras, the state holding company that controls Chesf, signed a contract with Norte Energia to buy, for R$ 130 per MWh ($57), the excess energy that Belo Monte can sell on the spot market. This price for excess energy, sold on the so-called “free” market varies daily and its average over the last 10 years was R$ 79 per MWh ($34). However, the mothering state company gave its “child” a helping financial hand, which helped convince the government’s Development Bank (BNDES) to give it a subsidized loan of R$ 22.5 billion ($9.8 billion). “And this is what they call clean, cheap energy”, Célio Bermann, professor of the Electrotechnical Energy Institute of the University of São Paulo (USP), said ironically. For this energy specialist, Belo Monte comes at a cost above the world average of $1,000 per MW installed and will increase taxpayers’ costs because of the subsidy, built into the financing and sale of the dam’s energy. Norte Energia depends on Ibama, the licensing arm of the Environment Ministry, to know exactly when and how much energy Belo Monte will produce. The contract says that the dam needs to generate an average 4,571 MW per year (a mere 41% of installed capacity), with 70% of this guaranteed power going to the national grid. As the reservoir that feeds the main powerhouse is relatively small, the water it stores during the rainy season will not be sufficient to generate even 10% of its capacity during the height of the dry season. One of the conditions imposed by Ibama in granting Belo Monte its operating license is that the Xingu River needs a minimum flow rate during the rainy season to maintain the health of the eco-systems of the Big Bend, downriver from the dam at the Pimental site. Belo Monte does have an attribute, however, that weighed in the decision to build it: it can generate an abundance of energy during periods of the year in which hydroelectric plants in the Southeast and Center-West, the main electricity-producing regions, operate under the restriction that their reservoirs can’t be left empty. In 2012, it was necessary to generate an average 14,300 MW per month by starting up more thermoelectric plants, at a cost to the country of R$ 12 billion more than the cost of hydroelectric power. For the residents of Altamira, the electricity that Belo Monte will generate is still a fantasy. So far, the dam has only caused them one interruption of power after another. The electricity distribution network, with its wires and transformers dating back to the 1970s and 1980s, can’t support an increase in power consumption. During the Amazon summer, temperatures almost never go below 35 degrees Celsius. In Altamira, insufficient electricity forces Climatech, an air-conditioner retailer, to keep its air-conditioning off, which turns the store into a greenhouse. And clients can’t support the heat long enough to buy a unit. “We are building the biggest dam in Brazil and we have no power”, laments Evaldo André, 33, owner of the company, who owes his own prosperity to Belo Monte; in two years, the company’s staff has grown from five to 25. Copyright 2013 Folha de S.Paulo. All rights reserved. All materials contained in this page may not be reproduced in any media, whether electronic or printed, without the prior written permission of Folhapress (pesquisa@folhapress.com.br).